WASHINGTON, Jun 17 2015 (IPS) - The 7.8 magnitude earthquake that shook Nepal in April, and the numerous aftershocks that followed, left the country with losses amounting to a third of its economy. As this South Asian nation of 27 million people struggles to get back on its feet, a major donor conference scheduled for Jun. 25 promises to bring some relief, but the extent of the disaster means that Nepal will be dealing with the fallout from the quake for a long time to come. The country’s post-disaster needs assessment reported damages of 5.15 billion dollars, losses of 1.9 billion dollars and recovery needs of 6.6 billion dollars. The housing sector bore the brunt of the disaster, accounting for three-fifths of the damages and half of the country’s most pressing needs. Nepal Finance Minister Ram Sharan Mahat has called this the worst disaster in Nepal’s history. Over 8,000 lives were lost, 22,000 people were injured and over 1,000 health facilities were destroyed, according to government data. An additional three percent of the population, which amounts to roughly a million people, has been pushed into poverty because of this disaster, according to the World Bank. The United Nations Office for the Coordination of Humanitarian Affairs (OCHA) said on its website that 8.1 million people are in need of humanitarian support and 1.9 million require food assistance. Only 129 million dollars of the 422-million-dollar humanitarian appeal by United Nations have been raised. Nepal, a developing country saddled with debts up to 30 percent of its gross domestic product (GDP) and dependent on external aid, had nonetheless been making developmental and economic gains before the disaster struck. For instance, government data indicate that the percentage of people living in poverty fell from 42 percent to 23.8 percent within the last 20 years. “The disaster has dealt a severe blow to our aspirations,” Mahat said. The donor conference later this month, to be held in Nepal’s capital, Kathmandu, is expected to tackle strategies for reconstruction and the provision of financial support. “The economy of Nepal took a huge hit from these earthquakes and there is a danger that many of the country’s impressive gains in overcoming poverty could be reversed,” said Annette Dixon, vice president for the South Asia Region at the World Bank. The conference will be jointly conducted by the Nepal government, the Asian Development Bank, the European Union, the government of India, the Japan International Cooperation Agency, the United Nations and the World Bank. More challenges lie ahead for Nepal as the annual monsoon season approaches, potentially displacing thousands more people. Charity groups such as CARE are scrambling to provide iron sheeting to households and those in temporary shelters to keep them dry, according to the group’s recent update. Orla Fagan, public information officer at OCHA’s Asia Pacific regional office, said in an email to IPS that providing shelter is a key concern. “There were around 500,000 families affected and left without homes after the two earthquakes,” Fagan said, adding that greater relief efforts are needed before the country can move on to reconstruction. Rupa Joshi, communications manager for the United Nations Children’s Fund (UNICEF) in Nepal, is concerned about the country’s fragile hillsides. Agencies like UNICEF and the World Food Programme (WFP) are working to help children return to school, provide safe birth-centers and deliver food to people in Nepal’s hard-to-reach mountainous areas. Meanwhile, groups like Jubilee USA Network, an alliance of over 75 U.S.-based NGOs and 400 faith communities, are fighting to help Nepal obtain debt relief from the World Bank, the Asian Development Bank (ADB) and the International Monetary Fund (IMF), to which Nepal owes about 54 million dollars. Nepal could also qualify for assistance under the IMF’s Catastrophe Containment and Relief Trust (CCR), which aims to relieve debt burdens of low-income countries like Nepal. 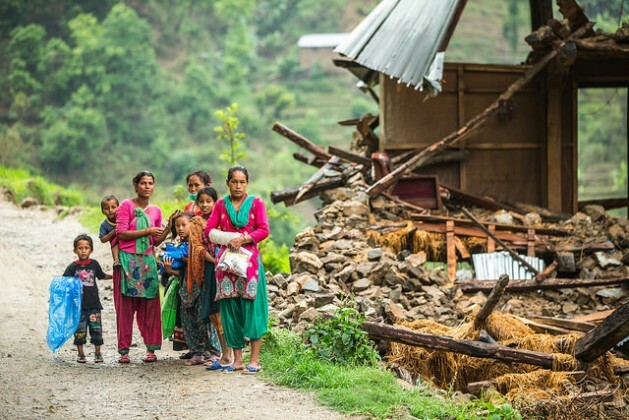 To qualify for the trust, Nepal will have to demonstrate that the natural disaster has directly affected at least one third of its population and destroyed more than a quarter of its productive capacity. Jubilee USA Network has succeeded in securing similar debt-relief schemes for several Ebola-stricken countries by applying pressure on the IMF. LeCompte said the Jun. 25 conference is crucial for Nepal.